Now that the character's head is ready, you can move on to the body. You can do a simple rigging where all of the body parts are independent one from the other, or create some parenting between some of the layers. Refer to Creating a Hierarchy to learn how to parent your layers. 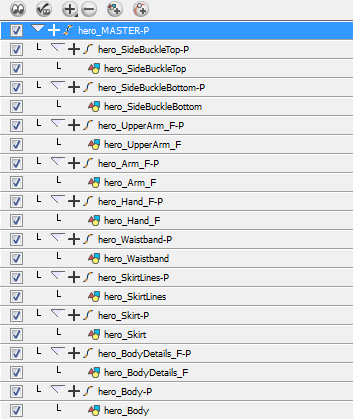 Simple rigging consists of leaving the layers in the Timeline view without doing any kind of parenting. Later on, you will attach those layers to a master peg and organize them in the correct order. Your drawings must be connected to a Composite module. A Composite module takes all the drawing layers connected in it and flattens them into a single image which allows you to organize your network and manipulate your puppet easily. It also allows you to apply effects on your complete character. The Composite module is useful when you have to deal with a lot of modules in the Network view. If you import your layers into the Timeline view, they will automatically be connected to the Composite module available in the Network view. 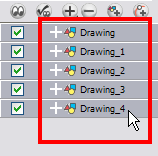 In Animate Pro, if your modules are not connected to your Composite module in the Network view, you can connect them all at once following the Timeline order. 1. If you do not have a Composite module, open a Module Library view. In the top menu, select Window > Module Library. 2. In the Module Library view, go to the Filters tab and select a Composite module. 3. Drag the Composite module to the Network view or press [Ctrl] + [H] (All Platforms). 4. In the Timeline view, select all the modules you can to connect to your Composite module. 5. Right-click on your selection and select Connect To Composite > select the desired Composite module. You modules are now connected to your Composite module in the same order as the Timeline view.